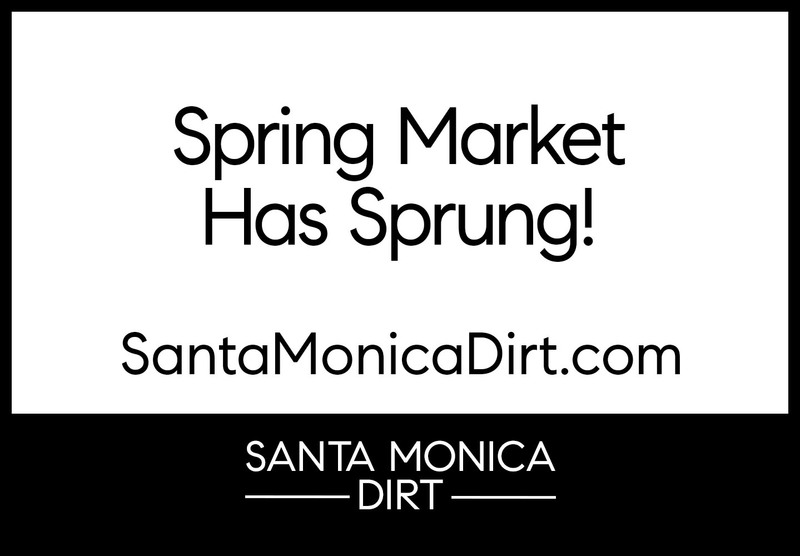 Multiple offers and sales closing well over the list price are again the norm this Spring in the north Santa Monica market. 251 24th is a two-story Spanish style home on the corner of 24th and Georgina that listed 10 days ago for $5,995,000. $6.3, or better, was the counter offer to all bidders. It’s a very romantic, emotional home which makes pinpointing the value difficult but $6.3+ may be a new record price per square foot for a home with no view on less than a quarter acre lot. 311 10th was sold by Pence Hathorn Silver in an off-market fashion and closed 10 days ago with little fanfare. It is a concrete and stucco contemporary design with a nice ADU and a swimming pool. 339 10th is a basic 1,900 sq ft 3 bedroom 2 bath that listed for $3,250,000, generated 11 offers and is rumored to be under contract for $3.6ish. 307 25th closed a few weeks ago in another off-market, pre-completion Pence Hathorn Silver transaction. It is a very architectural 3 level home with striking features and beautiful infinity edge pool and spa. 526 23rd listed a few weeks ago for $8,250,000 and sold within days in a competitive, multiple bid setting. It’s a three-level home with beautiful finishes that is closing for $150,000 over the list price. 6,700 sq ft with a pool and a pool house. Very cool house – great for entertaining. 342 12th Street – Listed at $5,999,000. 6 bedroom, 7 baths; approx. 6,500sqft on a fifty-foot wide lot. This is a nicely maintained 2010 home with full basement. Last sold in 2011 for $4,445,000. 433 20th Street – Re-listed for $7,295,000. Originally listed last May for $7,995,000 and did not sell. 5 bedrooms, 5 baths, approximately 7,800 sqft on 3-levels. 8,947 sqft lot with pool. Last sold in 2006 as a lot value for $2,280,000. 533 24th Street – Listed at $5,150,000. 5 bedroom, 6 baths; approx. 5,500sqft on a 60 foot wide lot Chateau style home built in 1984 with pool. Last sold in 2013 for $4,000,000. 1531 Georgina Avenue – Listed at $4,295,000. 4 bedroom, 3 baths; approx. 2,400sqft on a 60 foot wide lot with pool. Considering the square footage the rooms are surprising spacious. This is a very easy, add value opportunity. Offers due 4/1/19! 335 24th Street – Re-listed at $5,525,000. 5 bedroom, 5 baths; approx. 4,643sqft on a 8700sqft lot with pool. Originally listed last fall for $5,850,000 and did not sell. 121 Esparta Way – Listed by Pence Hathorn Silver for $14,995,000. 6 bedroom, 8 baths; approx. 8,400sqft on a large 12,190 sqft lot with pool, extensive patio, firepit and outdoor kitchen. This is gorgeous brand-new construction and will be open this Sunday from 2-5pm! 615 25th Street – Listed by Pence Hathorn Silver for $8,995,000. 5 bedroom, 7 baths; approx. 7,300sqft on an 8,700 sqft lot. This new construction has a killer basement and an open floorplan. I will be holding it open this Saturday and Sunday from 2-5pm. 302 23rd Street – Listed at $7,495,000. 6 bedroom, 7 baths; approx. 5,802sqft on 11,000sqft lot with pool. This formal 2005 Tuscan style home has a decent floor plan and a huge skylight but is in need of some lightening up for today’s ideal aesthetic. 401 18th Street – Listed at $4,995,000. 4 bedroom, 5 baths; approx. 4,500sqft on a 60 foot wide corner lot. This John Powell designed modern is bright with high ceilings and a detached (unpermitted) studio space. 424 14th Street – Listed by Pence Hathorn Silver $5,895,000. I sold this home years ago when it was newly constructed. 6 bedrooms, 6.5 bath, approximately 6,200 sqft. Built in 2004 in a size that can’t be replicated under today’s more restrictive codes. Enormous square footage on a 7,500 lot due to the large basement entertaining level. The backyard has a pool and nice hardscape. Last sold in 2008 for $3,960,000. 733 19th Street – Listed at $4,249,000. 4 bedroom, 4 baths; approx. 3,000sqft on a 60 foot wide lot with pool and guest house. I sold this property back in 2012 for $2,460,000. It is charming with a ton of character. 528 18th Street – Listed at $4,750,000. 5 bedroom, 6 baths; approx. 3,900sqft on a 60 foot wide lot with a huge guest house. House is ready for some updating. 704 Palisades Beach Road – Listed at $8,000,000. 3 bedroom, 4 baths; approx. 5,700sqft ocean front lot with pool and guest house. Remodeled in 2010 and very charming. 524 15th Street – Listed by Pence Hathorn Silver for $4,495,000. 3 bedrooms, 4.5 baths; approximately 4000 sqft on a 50 foot wide lot. This house has been maintained to the highest standard since it was completed in 2007. Excellent construction and quality. Currently there are 2 bedrooms upstairs but a 3rd could be easily created within the current footprint. Last sold in 2012 for $3,222,000. 251 21st Street – Listed for $4,650,000. 6 bedrooms, 5.5 baths; approximately 5200 sqft on a 60 foot wide lot with pool. Built in 1989 with large scale rooms and a traditional layout. Needs updating. 505 Georgina Avenue – Originally listed at $8,950,000 and reduced to $8,488,000. 6 bedrooms, 3.5 baths; approximately 3,800 sqft on a huge, nearly ½ acre lot. This house just went before the Landmark commission and it was decided that it does not merit historic protection, which is good news for potential Buyers. Update the existing 1911 home or build new. 710 Adelaide Place – Sold for $2,885,000. Originally listed at $4,595,000. 457 20th Street – Sold for $3,590,000. Originally listed at $3,550,000. 248 14th Street – Sold at asking for $4,299,000. 607 22nd Street – Sold for $3,150,000. Originally listed at $3,450,000. 9 are under contract and 10 have closed since the beginning of the year. It’s currently taking about 54 to get a home sold and interest rate are still unbelievable low. If you are looking to buy or sell a home, this could be a really good time to call me. Need more info? Call or email!